The BCAA Plus formula contains the right balance of branched chain amino acids (BCAA’s) ensuring a 2:1:1 ratio of: Leucine, Isoleucine, and Valine. These amino acids constitute approximately 35% of the amino acid content of the muscle tissue in the human body. The higher amount of Leucine reflects its importance in muscle metabolism as the most effective branch chain amino acid required for energy. However, each of these amino acids play an important role in protein synthesis and are used by the body for energy, to promote muscle growth, restore nitrogen retention and encourage recovery. When we exercise we oxidise BCAA’S (Branched Chain Amino Acids), if these are not replaced we can damage our muscle tissue and slow down our recovery time. BCAA’s are therefore essential to promote a faster recovery and better muscular gains. 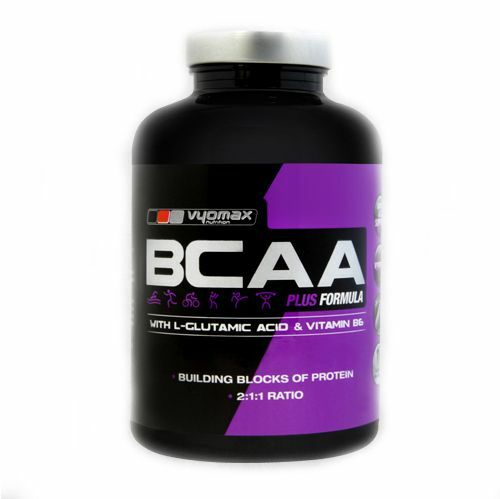 Vyomax® BCAA Plus Formula contains L-Glutamic Acid, which is needed for the production of energy from the BCAA’s and Vitamin B6, which enhances amino acid metabolism. This increases the effectiveness of the BCAA’s promoting a faster recovery and superior muscular gains.